Hidden form fields can be used to pass values into contact properties on a contact record without requiring the contact to fill in that information on the form. For example, when a contact submits a Request a quote form, you may want them to automatically have a Status of Open. 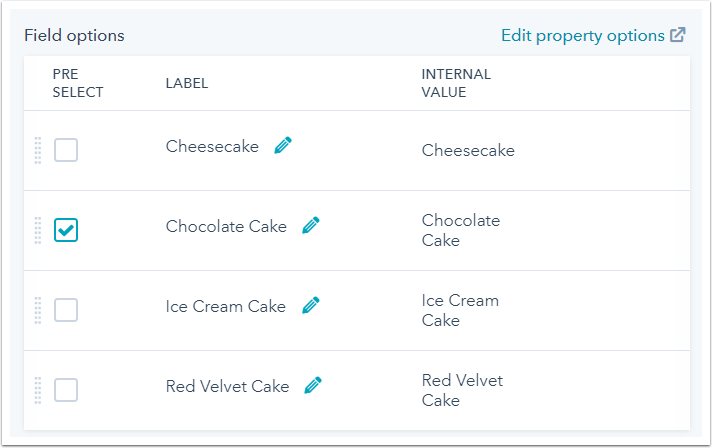 A hidden field can be used to set a value of Open on the Status contact property without the need for the contact to explicitly fill out that form field. In your HubSpot account, navigate to Marketing > Lead Capture > Forms. Click the name of a form or create a new form. In the form editor, hover over a form field to make hidden and click the pencil icon edit. In the left pane, select the Make this field hidden checkbox. Dropdown select/Multiple checkboxes/Radio select: select the value from Field options. Single checkbox: click to toggle the Select checkbox by default checkbox on. In the top right, click Publish.